There was a time when Jamie Masefield was playing in 5 different bands on a number of different instruments and free lancing gigs across New England. But in none of these experiences was he getting to play jazz on the mandolin. In 1993, he began booking one night a month at a non-profit coffeehouse in Burlington called The Last Elm Café, a move that put his vision on the map. The name, "the Jazz Mandolin Project" began as a personal title toward a goal and the monthly gig at the coffeehouse soon became the target of his energy. As Masefield developed this monthly gig, the other bands gradually fell away to make way for his growing aspiration. In the beginning, the group consisted of any jazz players that would come and play for a donation at the door. The premise was that it wouldn't be looked at as a strict jazz gig but a session where the musicians would play whatever moved them, no matter what genre it took them to. They would play for themselves and hope that the excitement would translate to the audience as well. And it did. Eventually, as the gig grew more popular, the first real incarnation of the project took shape with Gabe Jarrett (son of Keith Jarrett) on drums and Stacey Starkweather on electric bass. The Jazz Mandolin Project soon found itself touring nationally and in the summer of 96 made it's debut in Europe performing at prestigious events such as the North Sea Jazz Festival in Den Haag, Holland. Their self-titled debut CD was released on Sept. 3, 1996 on Accurate Records. The critically acclaimed album, with hits like "The Country Open", further helped to propel them forward as critics and fans took notice of a new sound. At the end of 1997, after years of touring, the first incarnation of JMP played its last gig so that each member could continue his own interests and the project could remain fresh and invigorating. To ring in the New Year right, Jamie took the opportunity to call some of his favorite musicians to form a tour of change, a waylay in the middle. Jon Fishman (from Phish) was his first call. (they had played together in a side project called "Bad Hat" which also included Trey Anastasio and Stacey Starkweather). Upright bassist, Chris Dahlgren received the next call. Masefield had met the New York City musician at a jam session and was impressed with his innovativeness and versatility. The "Tour de Flux" was born, an 8-week adventure of intense rehearsing and giging across the country. The return home put them in the studio, recording an album to document it all. The CD, "Tour de Flux", was released on Accurate Records on January 26, 1999. Critics saw this as a significant departure from the first album, in the direction of a more acoustic jazz, emphasized by the acoustic bass. Bob Blumenthal, writer for the Boston Globe and DownBeat magazine wrote, "If the jazz world gave awards for the most improved ensemble, the Jazz Mandolin Project would be a serious contender. Masefield has progressed by leaps and bounds." After Tour de Flux, Dahlgren stayed on to continue the great chemistry that had developed with Masefield. After working with a few drummers, Dahlgren brought to Jamie's attention the phenomenon of young drummer, Ari Hoenig who came on board to mark the next great phase of the project. This exciting line up continued to develop a unique approach while playing to packed houses. Amidst the touring, the famous jazz label, Blue Note Records took notice of the group's ability to bring jazz to young open minded ears and signed them for an album. On May 4, 2000, the Jazz Mandolin Project's major label debut was released. "Xenoblast" was given 4 stars in a review in DownBeat that said, "Masefield and company may constitute the world's most creative and most unusual power trio" (Philip Booth). With an intense touring schedule eventually Danton Boller replaced Dahlgren on upright and added a new rhythmically powerful sound that provided a logical extension to the evolving creative process influenced by modern drum and bass and techno sounds. In January of 2000 Jamie, Ari and Danton went into the studio and were accompanied by renown pianist and accordionist, Gil Goldstein (of Pat Metheny fame) and Chris Lovejoy (percussionist of Charlie Hunter) to create the largest JMP sound to date. Coming from that session was a self released CD (October 12, 2001) of special improvisations entitled "After Dinner Jams" which turned out to be a favorite for fans by having the closest sound to live improvisations during a show. Also in 2001 Greg Gonzalez replaced Hoenig. While continuing the interest in modern grooves, Gonzalez also added a strong Latin influence enlarging the groups scope of sound. 2002 was a big year for the Jazz Mandolin Project as it played debut concerts in Alaska and Japan in August along with a host of festival dates around the country. In 2003 the group released on its own newly organized record label, Lenapee Records, it's fifth CD. With national distribution, the album, "Jungle Tango" was released on March 25, with a CD Release tour to spread the fresh sound. 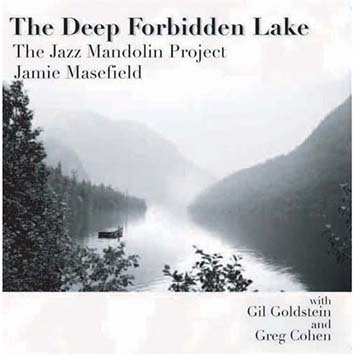 The Deep Forbidden Lake, the Jazz Mandolin Project's 6th studio album, was released on their own label, Lenapee Records/DKE Records. It is an acoustic, lyrical cd featuring 12 of leader, Jamie Masefield's, favorite songs, written by his favorite musicians. "I wanted to get back to some basics in my mandolin playing," says Masefield. "This album needed to be about playing quietly and relaxed, about melodies and arrangements and less about grooves and exploration. I also wanted to get away from my own compositions for a while and use some common ground by interpreting some things that weren't mine. This project became a secret mission that was fun." With tracks such as Neil Young's Winterlong, Leonard Cohen's Hallelujah, Tom Wait's Ol' 55, Radiohead's Everything in its Right Place and Ornette Coleman's When Will the Blues Leave, Masefield heads in a fresh, acoustic direction with this release. Accompanying the mandolin, are renowned musicians Gil Goldstein (Pat Metheny, Jaco Pastorius) on piano and accordion and Greg Cohen (Ornette Coleman, Tom Waits, John Zorn) on upright bass. The Jazz Mandolin Project decided to release the album a month earlier, April 4, via JMP's website www.jazzmandolinproject.com. Fans will also be able to purchase "The Navigators Bundle" through the website. This exclusive offering provides an in depth view of the album concept and how it was created including 2 bonus tracks, mp3 files of rehearsals tracing the evolution of the songs, photos of the recording sessions, the actual musical charts used, Masefield's personal journal of the album from its conception to completion and personal descriptions of all 14 songs (including the bonus tracks) and why they were chosen for this unique cd. Currently Jamie is focused on what is the culmination of all these years of touring, observation, playing and seeing the country from a unique perspective. Over the winter of 2005-2006, Jamie created an original multi media performance for Jazz Mandolin Project. This was premiered at the Flynn Theater in Burlington Vermont for two sold out nights in April 2006. This performance is a unique combination of literature, video and live musical accompaniment. Leo Tolstoy's famous short story, "How Much Land Does a Man Need?" is retold through narration, a new magical body of composed music and video footage that Masefield collected while touring the country in 2005. The contemporary observations follow the Russian tale in a modern context that allows the audience to reflect and ask questions of its own time and place.